The boxplot in the simulation is based on the data shown to the left of the boxplot. Notice that various aspects of the boxplot such as the mean and median are labeled. These labels can be hidden by unchecking the "show labels on boxplot" button. Beneath the data is a pair of buttons that let you specify whether you want to be able to enter data or to see statistics based on the data. When you use the simulation, try to modify the data in various ways and see how it affects the boxplot (see Video Demo). Try putting in some extreme values and see if they get labeled as outliers. Outside values are shown as "o's" beyond the inner fence. Far out values are shown as *'s outside the outer fence. You can delete all the data (by pressing the "Clear All button") and enter your own data. Your data can be typed in or pasted in from another application. When pasting, use keyboard shortcut for pasting (Command-V for Mac, CTRL-V for Windows). When you change the data, the boxplot will disappear. After you have entered new data, click the "Draw boxplot" button to redraw the boxplot. 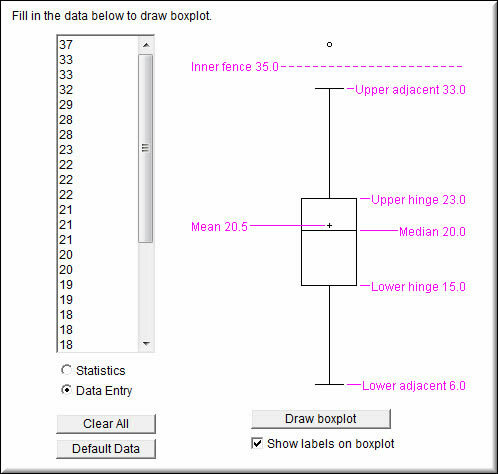 The screenshot below shows the boxplot simulation with its default data on the left. You can change some or all of the data on the left by editing individual numbers or pasting in your own data. When pasting, you must use the keyboard shortcut for pasting (Command-V for Mac, CTRL-V for Windows. As you can see in the video, the boxplot disappears when you change the data.